I have been reading about this book for months, and I finally sat down to read it. Dark Mirror has gotten great reviews online. After the last historical paranormal book I read and the disappointing experience I had, I was excited to redeem myself. This book didn't start well for me. The first two chapters were incredibly rushed and I felt as though I was being told things that happened the character rather than reading a story. I stuck with the story, hoping it would turn around. It did turn around for me. As Tory began the plotline of attending Lackland Abbey, the author hit her stride. There was character development, a budding love interest, and an exciting plot. Sadly, then the book took a very big downhill dive. The focus was no longer on Tory and how she was slowly learning about her skills. Rather, it became a time travel plot line with our Victorian heroes fighting the Nazis. And suddenly, Tory knew so much about her own powers and everyone else's that she took on the role of teacher to the new characters in the 1940s. Now I read some pretty far out books that require a ton of suspension of disbelief, however, this went far beyond my ability to wrap my head around. Perhaps if the author had used this plot as the second book in the series.... or even added another 100 pages. I find it baffling that suddenly Tory knew everything and was time traveling. The romance also pained me at this point. The language that Tory's love interest used was pretty (to put it as tactfully as possible), unbelievable. It was far too flowery, far too formal, and didn't fit the language of the rest of the book. I seriously dislike giving negative reviews, and especially two in a row. (I seem to be on a book slump). 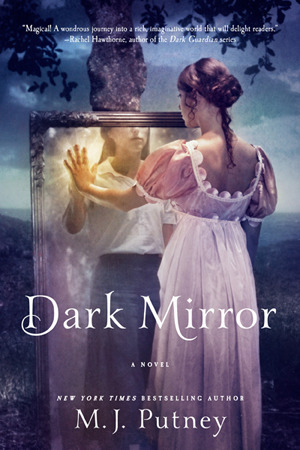 If you want to read more positive reviews about this book, check out the Goodreads page for Dark Mirror. Also, if you want to read a historical paranormal series that is fantastic- try A Great and Terrible Beauty by Libba Bray. PS- This book was for my Summer Reading Challenge! Aww I am sorry you didn't enjoy it! I understand what you mean. I hate when a book is rushed and it feels like everything just magically happened.